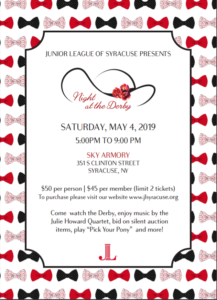 Night at the Derby 2019 | Junior League of Syracuse, Inc.
Join us for the Junior League of Syracuse presents Night at the Derby!! The evening will include food, delicious drink tastings, wine pull games, silent auction, raffle prizes, and live music by the Julie Howard Quartet. Tickets are $50 per person. Guests are encouraged to participate in our Kentucky Derby theme and dress in Derby attire! Proceeds from this event will support the JLS’ mission and community impact initiative and membership education and training opportunities. Thank you in advance for your support! Date and time: Saturday, May 4 | 5-9 p.m.
Click here to purchase your Derby tickets!